Rob Bell Is On Fire. The Gospel of Jesus is even better than this! 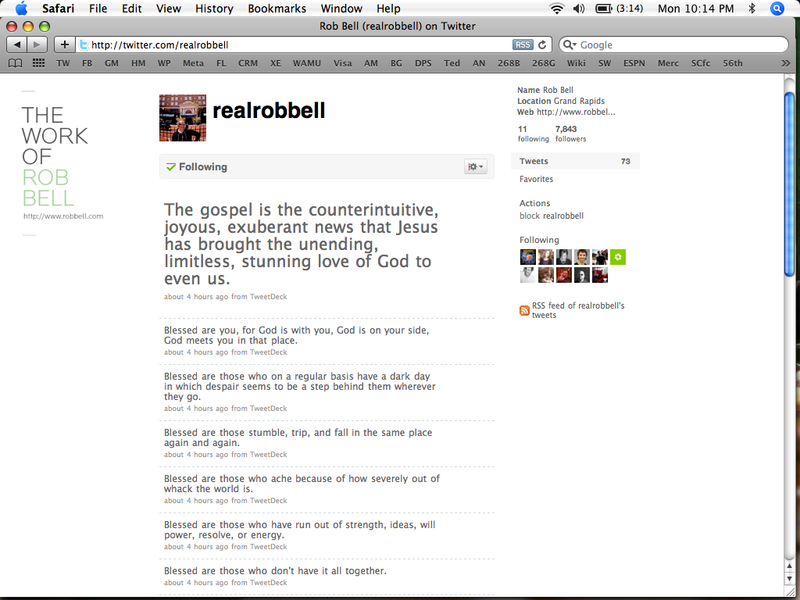 Rob Bell was on fire this morning with the Tweets. May your heart be enlarged, your spirit drawn upward, and your mind renewed with the hope that Christ dwells within you. You are being changed! agreed. i think he’d be fantastic to have dinner with. soo… about our bet. i have to be honest, reading through those quotes and thinking about possibly reading/receiving more like them, may have pushed me further than ever before in opening a twitter account. 1 year. 1 year. yes! trav, jump on the bandwagon! you can follow people like: ashton kutcher, shaq, barack obama, and myself….it’ll only cost you dinner!